Christopher C. Horner is the author of “Red Hot Lies, How Global Warming Alarmists Use Threats, Fraud & Deception to Keep You Misinformed”. He also serves as a senior fellow at the Competitive Enterprise Institute. 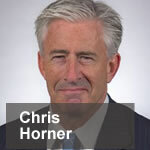 An attorney in Washington, DC Horner has represented CEI as well as scientists and Members of the U.S. House and Senate on matters of environmental policy in the federal courts and the Supreme Court. He has been a contributor in the Washington Times, National Review Online and Washington Examiner opinion pages, a guest columnist for United Press International, Energy Tribune and Spain’s Actualidad Economica, and regularly contributed to the Brussels legislative news magazine EU Reporter. He has also written in Investor’s Business Daily’s opinion and the Wall Street Journal’s letters pages.